Canonburycreations: Am I in time? A very quick post as I saw a challenge called Rudolph days and I love making Christmas cards so thought I'd join in. When I decided what to do I realised it could be suitable for Darnell's NBUS challenge and I think I am just in time! Apologies for the photo it's a very miserable day here! I used snowflake stamps that were free with Creative Stamping magazine and not been used before hence the Not Been Used Stuff acronym on Darnell's challenge. I also did a camouflage sentiment which is an optional theme. On Rudolph days anything goes as long as it's a Christmas card. This is so soft and pretty. Love your hidden sentiment! Great idea to combine the two challenges. Darnell's is a fabulous challenge! Rushing over to get my second card in before the cutoff time! I like how the sentiment blends in with the background, it's there, it's visible without been overpowering. I like this style. Love your beautiful soft color scheme--classy card! 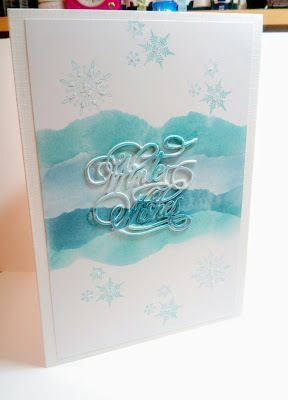 Its a beautiful elegant card, love the softness of the colours. 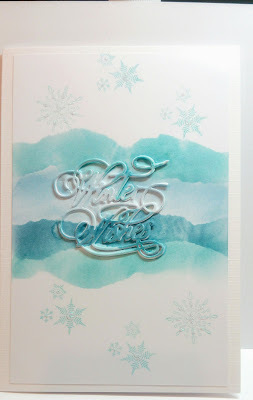 Beautiful Christmas card, Val... that die cut sentiment is gorgeous! So beautiful, I love everything about this card. Beautiful card, perfect fir for both challenges.